Home Companies Chongqing Gold Mechanical&Electrical Equipment Co.,Ltd. GD-265H AUTO KV D44 Automated Kinematic Viscometer is designed and made as per the industry standard of People’s Republic of China SY/T5651 Technical Condition of Petroleum Products Kinematic Viscosity Tester, GB/T 265 Petroleum products-Determination of kinematic viscosity and calculation of dynamic viscosity and ASTM D445Standard Test Method for Kinematic Viscosity of Transparent and Opaque Liquids. GD-265H AUTO KV D44 Automated Kinematic Viscometer is suitable to determine kinematic viscosity of liquid petroleum products (Newtonian fluids) by measuring the time for a volume of liquid to flow under gravity through a calibrated glass capillary viscometer at a constant temperature. Single chip microcomputer and colored LCD technology. High intelligence and automation. Intelligent signal sampling, data measuring, parameters operating, and result output. All the operations are finished automatically.English man-machine conversation interface. Easy to operate. 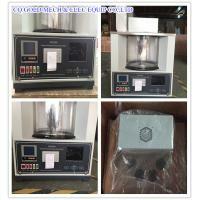 GD-265H AUTO KV D44 Automated Kinematic Viscometer is equipped with timing function. It can choose valid flowing time period and calculate arithmetic average automatically. It can also preset the viscosity coefficient , calculate the viscosity after the test and print the test results automatically. GD-265H AUTO KV D44 Automated Kinematic Viscometer can do one test alone or doing two tests at one time by setting the parameters.High efficiency. GD-265H AUTO KV D44 Automated Kinematic Viscometer has the parameters saving function. The instrument will automatically save the parameters of capillary tube diameter, coefficient and so on after these parameters being setted. When doing test with the same capillary, no need to set these parameters again. GD-265H AUTO KV D44 Automated Kinematic Viscometer adopts desktop and all-in-one machine design. Convenient to use.